In order to be compliant with federal, state, and local laws, your team will need to file reports that provide information about your donors. ActBlue makes that process really simple -- the donor data you’ll need to complete accurate compliance reports can be found in the “Reporting” tab of your Dashboard. Before you get started, you’ll want to read through our compliance guidelines. We’re happy to offer helpful information, but this is not legal advice, so you should consult with your counsel and compliance team when filing reports. You can find our guidelines in the “Disbursements” tab, as shown below. 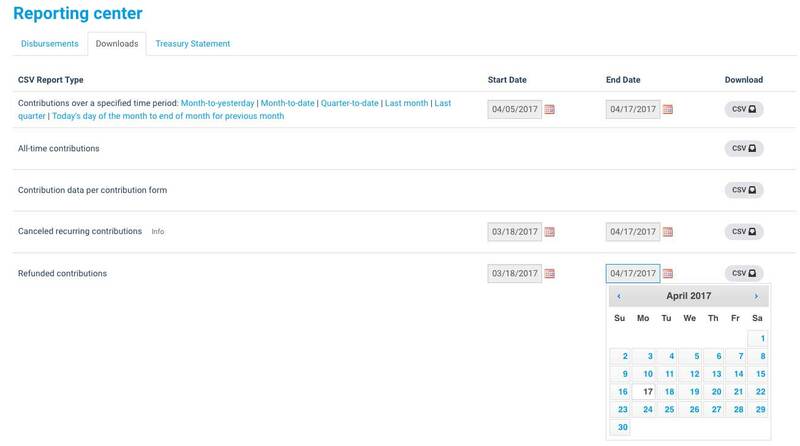 After you’ve read the guidelines, you can download a CSV for a specific check or disbursement of funds in the “Disbursements” tab. Just find the check you’re looking for and click the CSV button at the right of that row. You can also head to the “Downloads” tab of your Reporting center, where you’ll be able to export more of your CSV data. You can download contribution data for a specific time frame or a report for all of your ActBlue contributions. Your data will download in CSV format, which should work with all types of donor tracking software, including Excel and Numbers. If you’re going to upload the CSV into your state’s reporting software and you need it be in a different format, you can easily convert a CSV file into the format you need. You can also download data for a specific contribution form by choosing the form and navigating to its Statistics page. The Statistics page will show you a table of the contributions received on the form, broken down by refcode. At the bottom of the table, you should see “Additional tools.” Toggle open the dropdown menu, and you will be able to download CSV data for that form. If you’re a federal campaign using NGP for your compliance software, you will see an option to download NGP data in addition to the CSV option, which makes reporting even easier.